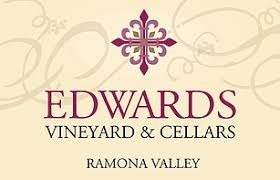 From one of the genuinely first rate producers in San Diego’s emerging wine region of Ramona. This wine has the soul of a roadhouse blues bar where troubadours of the tormented heart pass a beggar’s hat, the menu lists 15 deep fried appetizers, and you leave with sawdust in your shoes. This blend of Petite Sirah (60%) and Syrah (40%) is as taut and brawny as the Harleys in the parking lot with a nose as pretty as the slummin’ college girls looking for a fast ride. Aromas of blackberry bramble meld with a lovely trio of sweet oak, pencil shavings, and freshly turned earth. These warm, wood-laced flavors take on chocolate and char on the palate where rich, sustained fruit power and rollicking acidity give the wine energy and momentum. The broad, chiseled tannins first appear as a gentle undertow but then spread like the rising rumble of 20 bad boys on bikes and then linger and leave slowly as if becalmed by horsepower and adrenaline. 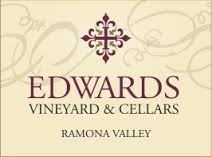 I’ve reviewed several of Edward’s wines over the years and they just keep getting better and better. They are among the cream of the crop in San Diego County’s burgeoning wine region but to be honest they stand up to some the best in all of California. While some of Victor Edward’s wines are dark and brooding, this Syrah is remarkably fresh and bright. Aromatic intensity is off the charts with bold, fresh berry, warm vanilla, and fragrant mint adding complexity. Six years from the harvest date, this has all the exuberance and vivacity of a young colt. The palate opens on the lush side but the acidity is explosive so the wine evolves into a lithe, nimble dancer with an edgy persona acquiring cranberry hints as it executes a long, scintillating fade. Age has softened the tannins but they still have some chew playing a supportive role to the brash, vibrant acidity. The wine was aged first in oak and then in stainless steel for an additional year. The result is a unique expression of California Syrah. 100% Estate-grown grapes. Just released a few months ago, the vintage date tells you something about how serious these wines are. They are never released until they’re ready. I’m know I’m out of season, which is not unusual for me. I suspect most people are stocking up on rosé or Sauvignon Blanc in anticipation of warm summer evenings on the veranda. But I’m opening a wine that can best be described as autumnal. An autumnal wine is dark and complex with plenty of weight and body like the clothes you wear to ward off the chill, something you sip while curling up with a good novel as the rain pummels the roof and the wind wails. Such wines get their character from oak that supplies the toasty flavors we associate with fireplaces or wood stoves. This recently released Syrah, made from estate-grown grapes, fits that description. Fig, a little white pepper, and lots of pencil lead and vanilla enclose the scent of wet autumn leaves—a very complex nose that reveals a different aspect every time you sniff it and repays exploration. More typical berry notes grace the palate with coffee holding down the mid-palate and a robust, persistent finish. Concentrated, but despite being big and ripe, there is nothing in excess here. Sturdy and taut without an ounce of flab, a very well structured wine,with medium-grain tannins, textured but not grippy. Oak gets a bad rap these days because of some of the clumsy, ponderous wines to come on the market in recent years. But the oak here is deftly applied and focused. Although chill evenings by the fire are months away, if you need a wine to stand up to hefty grilled meats this summer, this one will serve nicely. Very small production, available at their tasting room in Ramona and at selected shops in San Diego. When you visit the tasting room you get the added bonus of tasting their very fine Petite Sirah and Cabernet as well.